Making progress here … you? 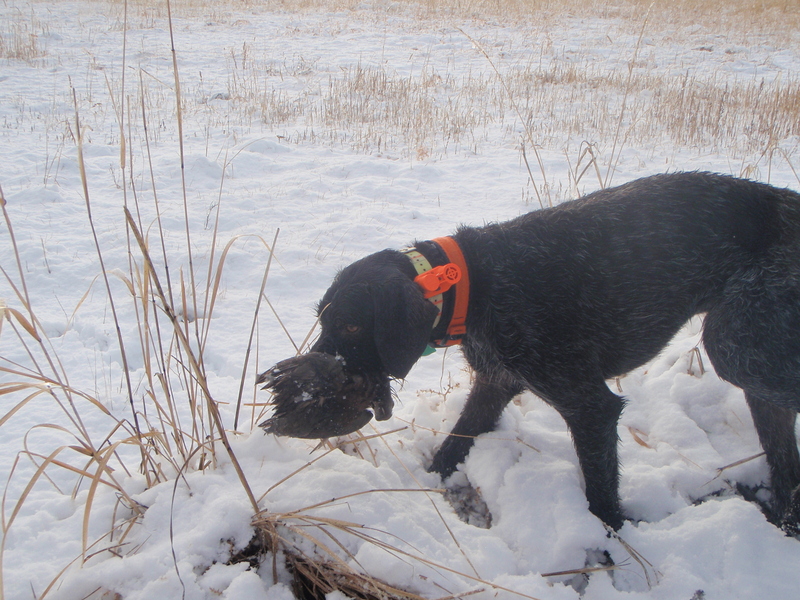 Not ready for retrieves yet – this is from last season. But soon, soon enough. One step at a time, the saying goes, and the steps are encouraging. Despite two TV seasons of breaking at the shot, Manny is making progress on his steadiness to wing, shot, and fall. We had a few setbacks without it, so we are back to using Bob Farris’ “gut hitch,” a variation on the Smith cousin’s flank half-hitch (thanks to all of you). It is the defining factor. That little tug on Manny’s waist may as well be an anchor chain for as solid as he stands the bird. A whiff of pigeon and he’s staunch, foot up and tail twitching into a straight and high twelve o’clock posture. Then the gut hitch goes on, I mutter a quick reminder of “whoa,” and move in for the flush. Boom goes the blank pistol (we’ve graduated), and a wirehaired statue watches the pigeon fly toward the desert, disappearing through the trees and out of Manny’s sight – and mind. A wiggle in the tail as the bird vanishes, but four feet remain firmly planted on the sandy soil. Ten more repetitions and I’ll take off the hitch. So, how’s your training going? What are your goals for this spring and summer? This was my one year old labs first season. With flushers things move fast so I wish I had videotaped some preserve hunts to see exactly what she does. She breaks on the shot sometimes so ill work on that. I’m also training her to hop in and out of the canoe on command for the upcoming fishing season. She’s also doing my taxes this year. The half-hitch on the waist works very well. I have two younger dogs that I plan for this when the weather breaks here in MN. I am anxious to get started, and then progress to the step beyond that to use an e-collar on the waist/flank to allow for a little more freedom for the trainer in establishing the conditions/scenarios for training. I hope to make enough progress to enter some AKC trials this season. Let’s stay in touch – that’s the next step for me as well. But here, we’ve had pretty good weather so can start now.